About the author: Althea Moses serves as EPA Region 7’s Environmental Justice Coordinator and the Deputy Director of the Enforcement Coordination Office. Her passion is helping people. She is a proud Civil Engineering graduate of Prairie View A&M University of Texas. Almost without exception for the past 15 years I have had what I consider a second Christmas – a day when my heart rate rises like it did when opening gifts when I was a kid. The date I’m referring to is the due date for Environmental Justice grant applications. The sense of anticipation – waiting to learn what projects are being proposed – is what Charlie felt when peeling back the wrapper of a Wonka Bar. My first gift is reading through the proposals. Many times the applications are from organizations and people whose paths I come across regularly. Through their applications, local communities introduce themselves and their communities. I get most excited though about proposals for communities of which I was previously unaware. Another gift is the sense of fulfillment that comes from the opportunity to make a meaningful difference in the lives of a community in need. It’s not the words on the paper that’s exciting – it’s the possibility of what can be achieved. This excitement comes from all I have seen and learned over the years about the possibility of what can be accomplished through projects that are funded at a relatively small amount compared to many other government grants. EPA’s EJ grants program, both Small Grants and EJ Collaborative Problem Solving, inspire sheer amazement when I consider the level of creative leveraging through partnerships and volunteers to achieve outputs and outcomes one might compare to projects ten times their monetary size. Yet another gift is how gratifying it is to see people who started at the neighborhood level with an EJ Small Grant working to understand and address local challenges, now recognized as environmental justice leaders. We have seen tools developed and then used to educate and assist parents and caregivers in reducing children’s asthma attacks and the number of school-days missed. We have seen the organizing of lead screening events, which taught children as young as pre-school age what it means to avoid and protect themselves from environmental hazards. How do you explain that lead dust is invisible in soil, so play on the grass? There’s a preschool curriculum that was developed and demonstrated which does just that! Meet people where they are – physically as well as in their understanding. It is amazing the number of people who can be reached, the results achieved, and the resources saved when we go to places where our target audience gathers. We can engage them in a manner in which they relate. Take the time to understand and value what is important to the communities in which you work. This is key to connecting in such a way that encourages mutual understanding, which may result in positive change. “Each one, teach one.” Train-the-trainer is a model that allows projects to be sustaining well beyond funding. When we use this approach, we multiply what we can achieve. Communities want to know what they don’t know about human health and environmental issues. When you bring information about a problem, bring information about the solution. This is hard – it does not excuse us from bringing information about a problem – but challenges us to work hard to find the solution. Sometimes solutions are found through outside partnerships. 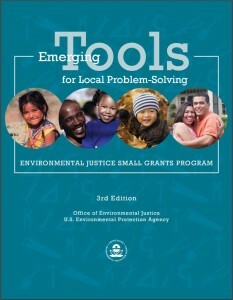 EPA’s EJ grant programs are among the smallest pots of money in the agency, but oh, the good they have done educating, empowering, building capacity, and ultimately, making a visible difference in communities across the country.